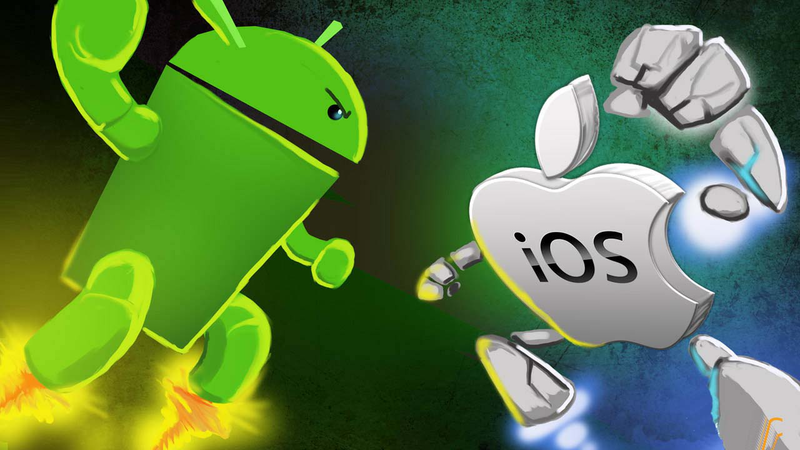 Android vs iOS : Which is the Most Preferred Smartphone Platform? Android or iOS : Which is the Most Preferred Smartphone Platform? Android and iOS, both are excellent. Quite a bit quality in both is common, but there are a few differences to consider when buying a Smartphone. There are a few set of categories. Let’s find out the winner in each. Take a personalized decision picking out the things that matter you the most. If we look at the numbers, roughly more than 3 million applications appear to be there in the Android Play Store and more than 2 million in Apple App Store. We can’t always trust the numbers. Honestly, most popular apps are available on both stores. Out of which, we only use a few of them. IOS has always been the most lucrative platform for professional app developers and new apps habitually appear there first. But things have changed. The android market share has now grown in a wink. At many places apple iPhone still takes the lead, but Mobile App Developers at many other places are more and more focusing at Android Mobile Apps first. Having a short comparison between both, play store has a higher amount of free applications than that of the app store. But, how can we overlook the best mobile games that land on app store first! And, many games even don’t even appear on play store. You can easily sideload apps on any android device. Download APK file, tick a box in settings, and install the app. You will also get alternative app stores afar the play store. But, using alternative apps and sideloading can be risky; good enough to damage your device opening up the risk of malware. Apple devices don’t allow you to download or sideload apps. Moreover, most people having a wider choice of apps prefer to buy Android devices. The key factor for Smartphone users is the Battery Life. It is said that Apple mobiles has a compressed battery life, whereas android devices are most preferred for its bigger battery. Thus, Os mobiles outlast the iOS devices. Both allow you view battery usage; both have the power saving mode facility that helps extend battery life by limiting connectivity, performance, and other power draining features. Moreover, all these features are more customizable on the Android devices. Let’s get to the charging department. Many Android devices specifically the latest ones offer fast-charging as well as wireless charging facility. However, the latest apple devices like iPhone 8, and iPhone x have implemented fast charging and wireless charging, but to avail this feature you will have to buy fast-charging adapter separately. Comparing both, iPhones now have fast charging and longer battery life. But, android have fast chargers included in the box. Android is customizable. Like, you can adjust the layout on your mobile home and lock screen the way you want; you can add widgets and shortcuts of the most Custom build mobile apps; you can vary the entire look of your device with the help of various launchers. With an iOS device you can just change the background and widget support is quite limited. Nevertheless, you don’t get the same level of freedom like android. Many things are locked in iOS devices like they won’t allow you to install third-party apps. If you want to give your Smartphone a unique and personalized look, Android will be the best platform for you. Both platform offer default email apps; you can set up multiple email accounts and view them at your convenient time in a single inbox. Not only Android, but iOS also offer an array of their-party applications for email. Moreover, Gmail is the strongest default app than that of iOS mail. This is the most important category everyone shopping for Smartphone will look for. Apple used to be the best camera phone capturing lighting, colors, and many other details. But, we can’t forget the latest android devices proving the assertion wrong. New Smartphone models like Google’s Pixel 3 and 3XL appears to have the best camera ever. But there are a few drops in the ocean of android. Most budget devices offer lower quality cameras; not as good as of iPhone. Google Photos is no doubt the best option. All your photos and videos can be stored in automatically. You can back up your videos and photos with both – Google Photos and iCloud. Considering the storage space, iCloud offers 5GB storage, whereas with Google Drive you get 15GB where you can auto store unlimited photos and videos in their original full-resolution. Fortunately, you can use Google Drive on iOS by getting it installed from the App Store. Since most preferred option in any Smartphone is the default apps, Android gets prevail in this category. Most features Apple Siri and Google Assistance offer are same, but Siri is more like a helper. It helps you set calendar appointments, searching out your required data on web, or make calls. Google assistance, on the other hand, has extra things to offer. In addition to Siri, it can offer useful suggestions. Having more conversational side, it can offer you entertaining games, apps, and other information owing to what you are doing. Isn’t this more versatile than Siri? Android platform has an exaggerated threat of malware. Till you don’t go outside the Play Store you will never encounter any problem in your device. No doubt, big brands like Samsung have enhanced its security level, but the careless nature of users is enough to experience the risk on malware. Regular updates are crucially important. Apple is already well-established in this category and has improved security for its users with Touch ID and FaceID. It has the ability to expel updates in more and more devices quickly. This feature gives it an express edge over Android. Moreover, if you are only looking for security, iPhone should be your best pick. Comparing the above treated points, android wins some categories whereas some are won by iOS. It is still difficult to evaluate exactly who’s the best. We can’t overlook that the best in both that controls the software and hardware is iOS. Ultimately, focus on the categories that are important for you and make your choice based on that. Like, if security is on the top of your list, go for an iPhone; and if the battery life is important, Android will be the best choice.